For breakfast, I don't eat the almond butter I discussed earlier all by itself. Well, actually sometimes I do, with a spoon, but I would rather not admit that. Most of the time I eat it with the Costco whole grain bakery bread. 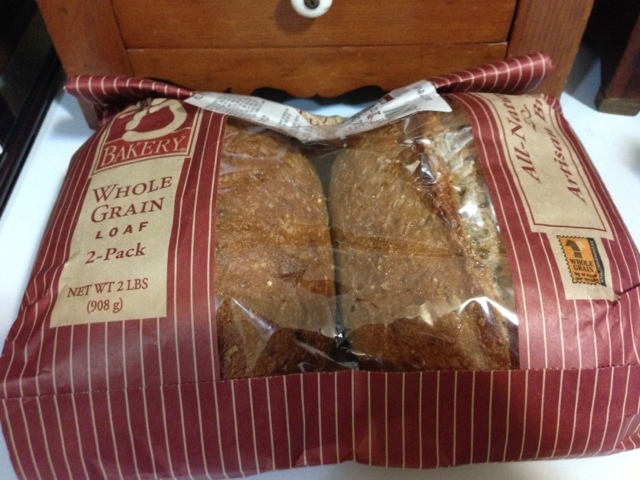 This bread is a good mix of hearty grains with lightness. I wish it were possible to get it sliced, but I'm willing to slice it myself for the taste, texture and general yummyness. 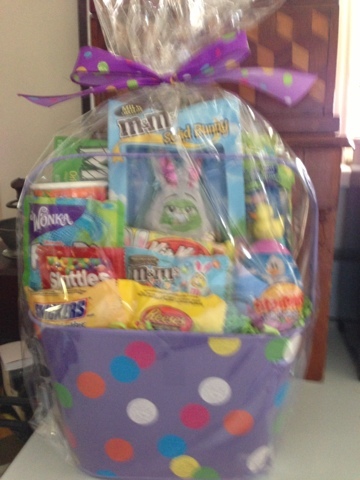 This Easter basket is on deep discount at my Costco today. 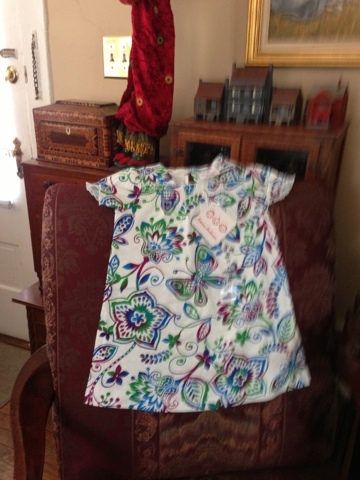 Actually, so inexpensive I bought it and will figure out what to do with it later. 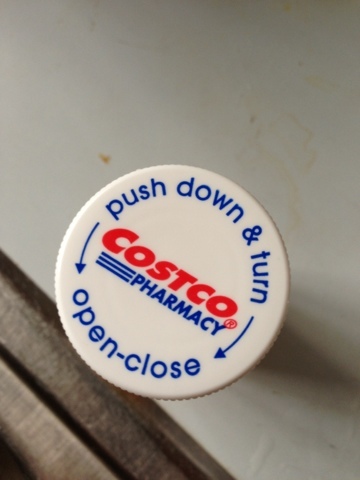 I've gotten my prescriptions from Costco for a long time. It's mostly a matter of convenience. I was having to make separate trips to get prescriptions at the grocery store, but I always find myself at Costco. Go figure! The prices have always seemed good. I noticed on the information sheet from my insurance company, concerning the only prescription I'm taking, I pay $9 for a three month supply and the insurance company pays an additional .47 cents. I was happy to hear about this Consumer Reports study that shows Costco is a good choice! Bob and I used to have a bag of microwave popcorn every night. We bought them in large boxes from Costco and thought it was a reasonably healthy snack. But I started to become concerned about the chemicals used in the bags, and we tried regular popcorn. Once we tried it, we liked it better than microwaved because we could control the salt and fat. But I had trouble finding a reliable supply. I found a good brand and then the grocery store stopped carrying it. Some brands I tried had small or unpopped kernels. 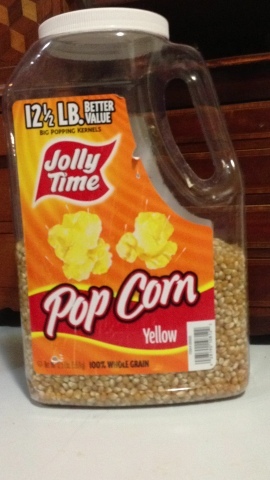 Many grocery stores barely carry regular popcorn at all. When I saw the popcorn in the photo at a Michigan Costco, I had to have it. It's great. Large kernels. Pops fully. Only one ingredient: popcorn. I have never seen this in my Tennessee Costco, but I'm hoping. For twenty years, maybe longer, I've had the same thing for breakfast: toast and nut butter. 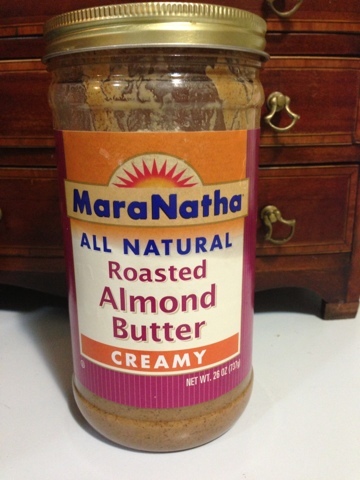 Used to be peanut butter but about ten years ago I switched to nut butter -cashew or almond. I was thrilled when Costco started carrying almond butter. A small container from the grocery store used to cost me over $10. Now I pay less than $10 for 28oz. In 1956, when I was eleven, we moved to Tachikawa, Japan for three years. My Dad was career Air Force. 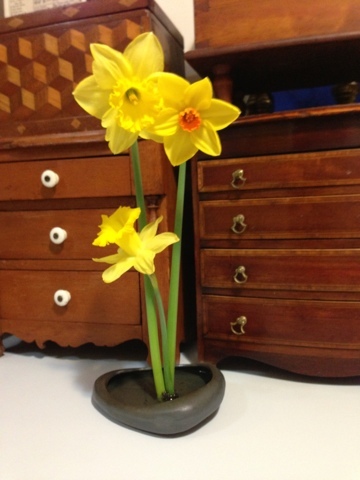 My Mom took classes in ikebana, Japanese flower arranging. I remember she taught me the importance of three height elements: earth, man and heaven. I'm pretty sure the container in the photo is a relict from those ikebana classes. The Costco daffodil bulbs that were planted in the fall look good, I think. Now I understand the comments at my book club about only eating horseradish at one time of the year! For Jews celebrating Passover, horseradish symbolizes the bitterness of slavery in Egypt. Why we eat horseradish at Passover. This never occurred to me when I served horseradish with the beef, in fact I'm not sure I knew this, so it couldn't have occurred to me. I saw Flashdance, the Musical, last week; it developed and has been playing in England and is currently on US tour before going to Broadway. It struck me as very English. The main theme is social mobility. The fact that Alex is a dancer following her passion is secondary to the question of whether she can transcend the status distance between herself and her factory owner boyfriend. Social mobility was also a central theme of the English Booker Prize novel we read for book club. 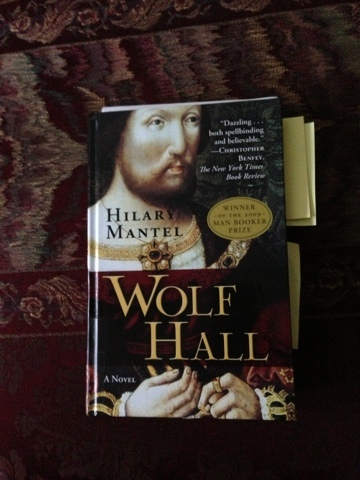 Wolf Hall is the story of Thomas Cromwell's rise from being son of a brewer to being Henry VIII's counselor. 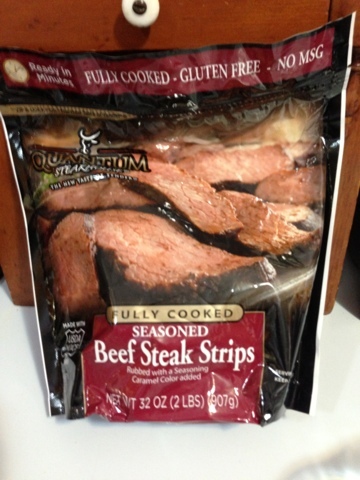 My fellow book clubbers, not overly class conscious and an accepting lot in general, seemed to enjoy the beef steak strips from Costco that I shared at our Wolf Hall discussion. I haven't perfected how to serve these. They were OK cold, Next time I would bake for 15 or 20 minutes. I served with horseradish and catsup, which, in a nod to social climbing, I called tomato confit. For six women, the "Beef Steak Strip" 32 oz. pack was more than ample. In Tennessee, construction was quick, so I'm betting the North Brunswick store is open by Christmas 2013, if not significantly before. This weekend I needed roast beef to take to my book club discussion of Wolf Hall by Hilary Mantel. Somehow beef seemed the best fit with the Henry VIII theme. I remember, in 1972, before we had children, I used to buy a rib roast every week. After a roast beef, Yorkshire pudding dinner (my ex was English), I used the leftovers for roast beef sandwiches or stew. A rib roast cost about $5.00. I've gradually stopped using beef and honestly cannot remember the last time I bought a roast. In Costco this week, the smallest rib roast was $50. The boneless roasts seemed to be a better deal, although larger, and I came close to buying $115 worth of beef, but the necessity of figuring out what to do with all that beef, the freezer space commitment, and the butchering were too daunting. I'll write about my solution and how it worked out in Part Two (after book club). Scatterbrained people have a terrible time with socks, because there're two and they're not attached and they come is a seemingly infinite variety of colors and patterns. It's easy to see all the potential problems that can arise: Not matching. One missing. Both missing. When I was working, I just didn't have the excess mental energy to deal with sock emergencies every morning, I needed reliable socks. So, I began wearing the black men's Gold Toe socks from Costco. (I usually wore pants to work.) These unvarying socks saved me countless hours of useless sock searching and decision making. Once retired, I tried a mixed pack of three cute pairs of DKNY women's socks from Costco. I seem to have already lost one pair completely. And I have a suspicion that one of the other pairs might be gone, although since that pair was black, they just might be camouflaged among all the men's Gold Toe socks leftover from work. You really start to doubt yourself. Where can a frigging pair of socks go? Feet. Laundry hamper. Washer. Dresser. Feet. 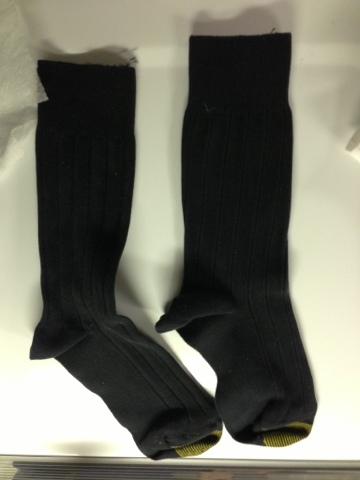 I never even would have noticed a missing pair when all the socks were identical. Last fall, I fell for stretch jeans made by a well known on-line manufacturer from Maine. These jeans, reportedly favored by Oprah, are pretty great. Instead of feeling too stiff, a feeling I started to get from jeans about fifteen years ago, these feel comfortable, right, like I want to wear them instead of anything else. They cost about $70 each, and I bought enough pairs to make me happy. Why, oh why, didn't I realize that Costco wouldn't let this trend pass them by? 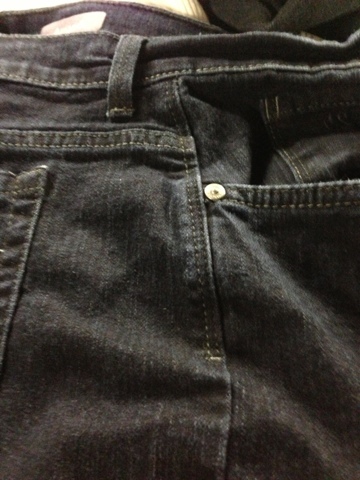 Yesterday, I bought great stretch jeans from Costco for around $15. They seem in all ways comparable to the more expensive jeans. You know, I'm glad I have this blog as a reason to buy and test Costco products, or I might have felt a little guilty about buying another pair of jeans. I saw on TV that Costco's most popular item is the TP. 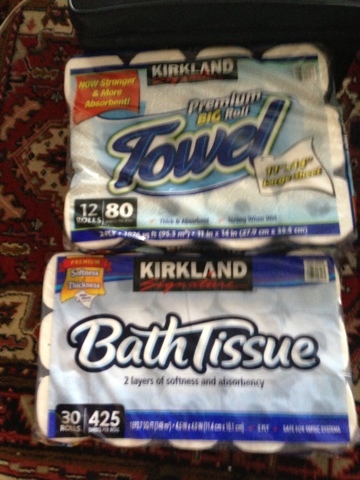 Before Costco, I can't believe the frequency at which I used to have to buy TP and paper towels from the grocery store. And the frequency at which I would forget to buy them, and we would run out. Now, we hardly ever run out of either. Maybe I like Costco so much because it is an especially good place for scatterbrained people to shop. 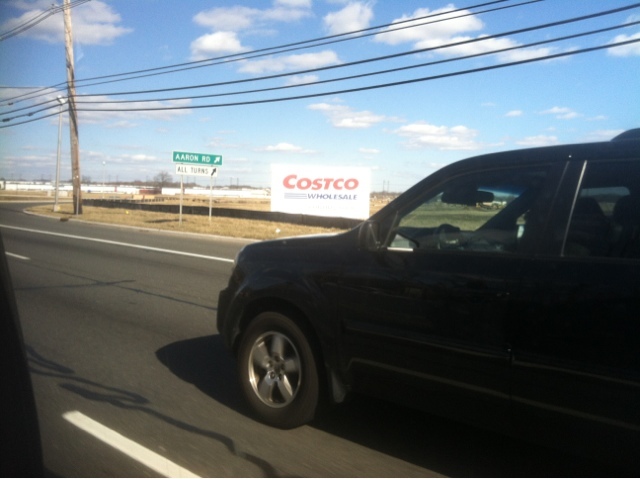 Here's the link to a transcript of the most recent earnings call with Costco CEO Galanti, March 12, 2013. I can't begin to do it justice in a summary. If you're interested, please read the call. Executive members are approximately a third of our membership base, and a little over two-thirds of our sales. 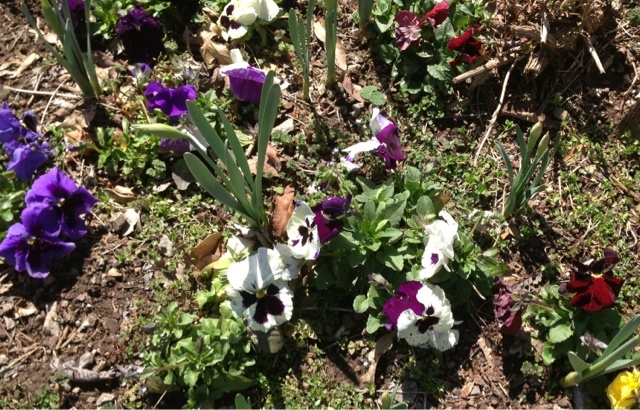 I've never had much success with pansies. They don't grow well in the Carolinas, so I never got in the habit of growing them here in Tennessee. But this year, in the fall when Costco had them, I scooped up a flat. They've been hardy in pots on my back deck, and they're looking good in the ground around my mailbox. The daffodils coming up in the pansy bed are also a Costco product. The daffodils look a little pekid (weak) to me, I hope they perk up. We eat lots of Costco ice cream. Our Costco usually has vanilla only, but we buy the caramel toffee on the rare occasions when it's in stock. Costco fudge bars are a staple at our house; and we went through a Skinny Cow ice cream sandwich phase. We decided the ice cream sandwiches aren't our favorite; for low-cal/low-fat, we stick with the fudge bars. I remember the first time I had sherbet in real fruit cups. We were visiting my husband's* cousin and her husband in the Belgravia neighborhood of London. He was an older man, a graduate of Sandhurst, a steel magnate before the steel industry was nationalized, and, at that time, a food wholesaler. Their elegant apartment, full of china, crystal, and engraved botanic prints, opened onto a lovely garden with a working fountain. I was impressed by everything, including the ice cream presentation. Sherbet in fruit cups will always remind me of that elegant day. 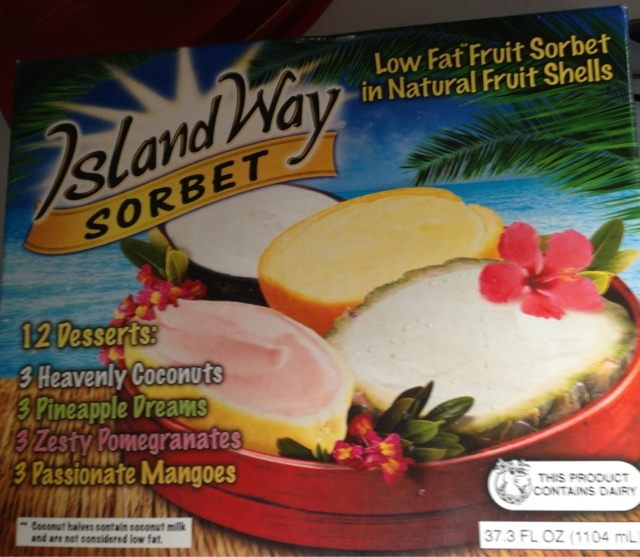 After trying the Costco ice cream fruit cups, I liked them and was pleasantly surprised by the calorie count (three out of four under 100 calories). They come from South Africa. I'm wondering if these could possibly be the same brand I had in Belgravia so long ago. *I've received at least one question about this wording. This was my husband at the time, now my ex-husband. We were married for another fifteen years after the London trip, but have been divorced for ten. I didn't want to get all involved in that story when I was writing about ice cream. Every spring I look at the garden sculptures in Costco. 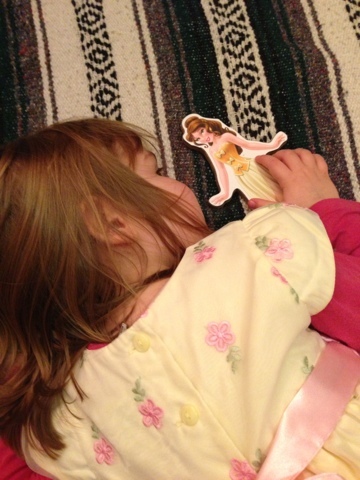 I regret not getting one several years ago of a big sister reading to a little brother, not that this ever actually happened between my kids, but it could have, and would have reminded me of them. Nothing since has been even close, so I've been hoping for abstract. 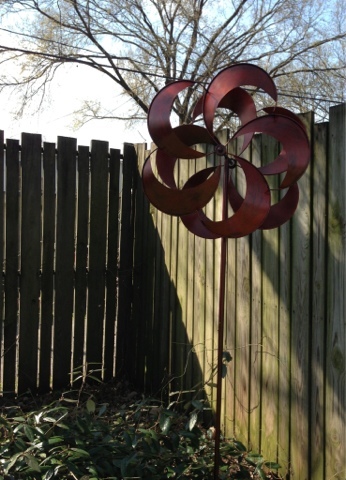 This year I considered the giant wind catcher and finally purchased it. Very easy to assemble. Assembling stuff doesn't usually intimidate me, but this was super simple. Maybe too heavy to turn easily in the sheltered spot I've put it, but I didn't buy it for the rotation. And it does move. I like it, I'm trying to get used to the unusual tangerine color it flashes in the sun. "I should have bought two!" When I shop at Costco, the large quantities aren't the problem for me (usually). Instead, the ever changing mix of products means that, if I bought it once, I may not be able to buy it again. And the great qualities and prices mean that I'll never find it in another store at that price. Thinking this as I'm sitting here at the SEC tournament waiting for the Mizzou/Texas A&M game with my Costco-purchased Calvin Klein wool car coat, wearing my Kirkland cashmere turtleneck sweater. Neither of these were at my Costco this winter. My Dad has moved to Nashville from Santee, SC. He had been living alone, but he's here for some orthopedic rehab. It's great to have him here, and it will be great to have another person to shop for! I've moved totally away from a handbag/purse/pocketbook. I love the wallet that Costco sold before Christmas. I probably should have bought two. This holds my phone, my cards, money, and keys. 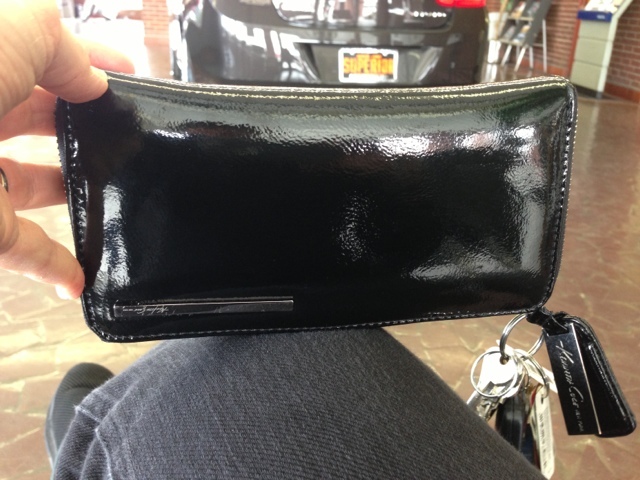 Of course, not using a bigger purse means I never have a comb, a lipstick, or any snacks. All of which I could use right now, here, waiting to have my oil changed at the car dealer. I've gotten into the habit of listening to audiobooks before I fall asleep, which means that I miss a great deal of the content of the books. My recent audiobook was Extra Virginity: The Sublime and Scandalous World of Olive Oil by Tom Mueller. I was amazed by the history and processes involved with this historic food. I had no idea what cold pressed meant or any of the other intricacies of manufacture. I recommend the book. 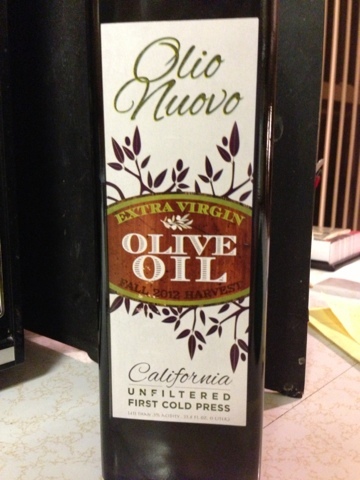 I'm very excited to try the Olio Nuovo currently at Costco because it's going to be wonderful. From the book, I learned this is valuable and rare. Although, because I slept through a great deal of the book, I'm not sure exactly why. We're having fun dissing the Greek yogurt that I bought at Costco. 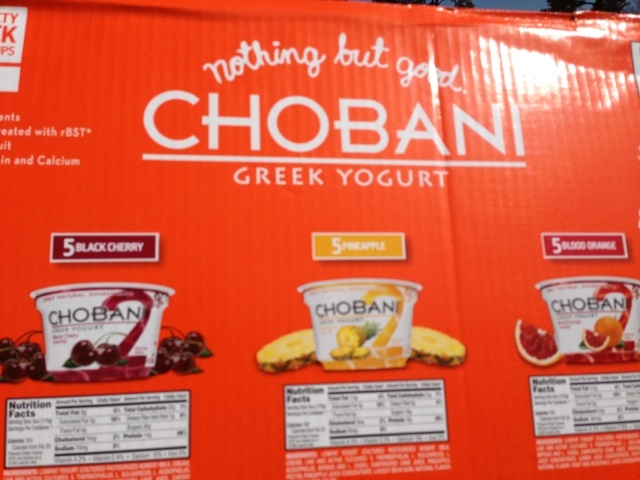 My Dad just doesn't get yogurt at all, Greek yogurt is like yogurt squared. And, of course, buying it from Costco means I have container after container. I got him to eat one. I ate two. 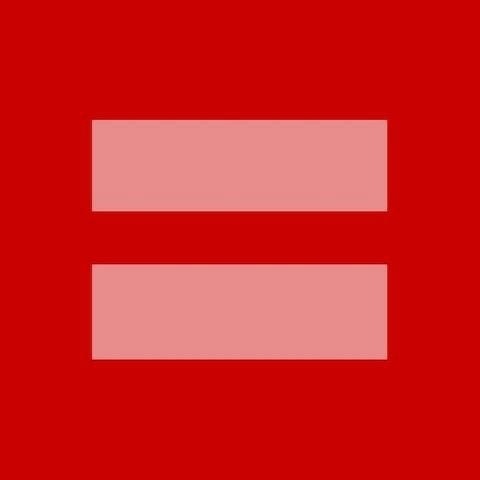 (Actually, I don't care for it either.). Leaving me with MANY. Many. We've given some to neighbors. I don't want to be unfair to this product. I think it's excellent. We old folks just didn't grow up with yogurt; and some of us never developed a taste for it. there was fruit you could stir up from the bottom. My dad needs a wheel chair. Costco won't deal directly with Medicare. Can you blame them? I don't. I'm not willing to deal directly with Medicare either. It's easier to let an "experienced" Medicare biller charge what I'm guessing will be inflated prices and not as good as Costco quality. Ok, I can tell I'm grumpy and tired and need to stop now. At the Spartanburg Costco today, I noticed an Associate approaching people in line and explaining the Executive Membership. This reminded me of something that happened last Friday in the Brooklyn Costco. At the check-out line, a man came up to me, spoke to me in Spanish and flashed an Executive Membership card . "Oh, I have one", I said. "You have one," he said in English, nodding. I was really flattered that he thought I looked Hispanic - I guess because I think of Hispanic women as having great style, and also because he hadn't pegged me as a tourist. Luggage used to be something I knew something about. My first husband was in the luggage industry, and I picked up some of his knowledge. At least, according to me. My good luggage fell apart after the divorce, and I had to buy my own bags for the first time. I tried a couple cheap brands thinking the airlines would destroy them anyway. But, no matter how cheap it was, I found out the hard way that, if it only lasts once, it's no bargain. Being in a strange city with luggage with a broken zipper is no fun. I decided to buy the good stuff. I didn't like the previous version of Kirkland wheeled luggage and chose instead the Tumi wheeled case that Costco carried at that time. What a great case! It has lasted through NYC, Detroit and many less taxing airports. I think it's a little over engineered in terms of pockets and unnecessary neat features, but it has only grown on me. 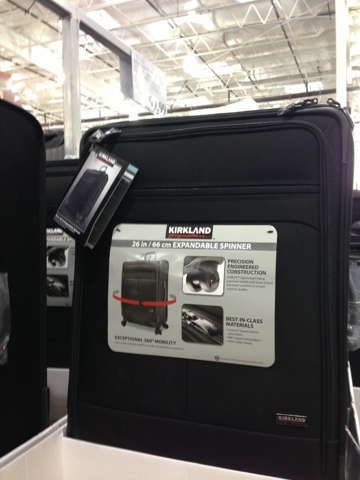 Costco sold off their Tumi luggage stock and now have a Samsonite/Kirkland hard shell case and a newly designed, soft-sided, wheeled Kirkland line. I don't know anything about hardshell cases, so don't have an opinion there; but the soft sided case is definitely better-made than the previous Kirkland luggage. Someone made quality decisions on materials. I don't think the design is anything special. In my West Nashville store yesterday, the 26 inch version of the new Kirkland carry-on was on sale. I'm hanging with the Tumi, only wishing I'd bought two. 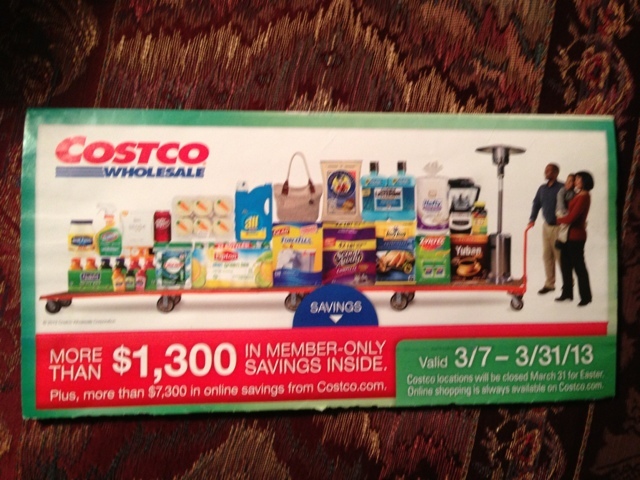 Kimberley at the Addicted to Costco site has the new USA coupon book available as a PDF file. Dates are from March 7 to March 31, 2013. Lots of great things on sale. As often happens, I will miss out because the ones that I use, I bought last week. I saw a good buy on the Moist contacts mentioned in this previous post. When I FaceTime from Tennessee with my three-year-old Brooklyn granddaughter, she often wants to show me her room, but the wifi cuts out before halfway down the hall. 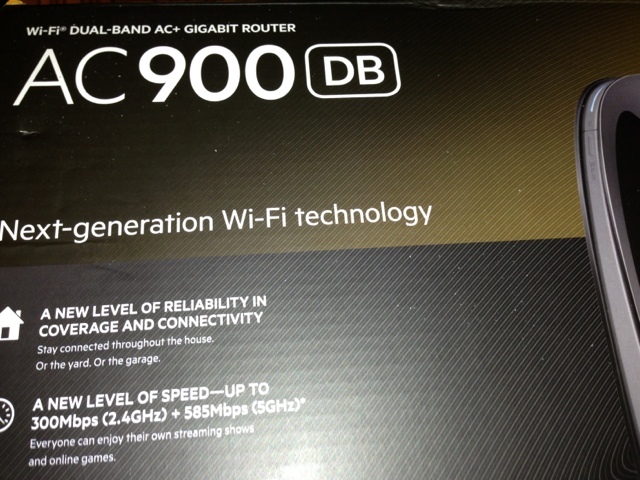 Seemed like a good idea to buy the strongest, most super wifi I could and replace what they had. I got this from Costco and installed it during my stay, but it didn't make any difference. Half way down the hall, the thick limestone walls seemed to be able to block the signal. Thank goodness for the great return policy; hopefully, I won't have any trouble returning the wifi OR the Hanna Andersson butterfly dress. My granddaughter has decided butterflies make her sneeze. Costco on the first of the month is always busy, and the Brooklyn Costco was no exception on March 1. Very crowded. Over half of the people were speaking in languages other than English. I recognized Spanish, and maybe Russian, but I know there were others - Middle Eastern and Asian. Often I hear foreign languages in our Costco in Tennessee; but mostly, English. 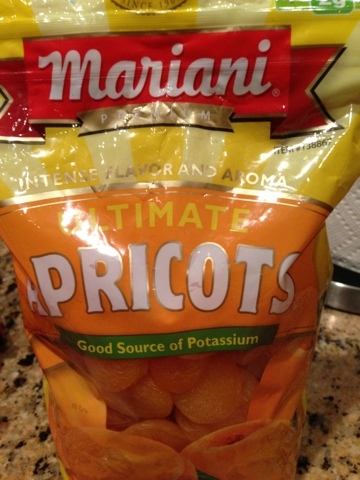 Re sale items: I only saw one item on discount - that was dried apricots. When I passed them a second time, a young man was putting the last two bags in his cart. The apricots sold out very fast, so I'm thinking one may need to be fast to snag a bargain in Brooklyn. 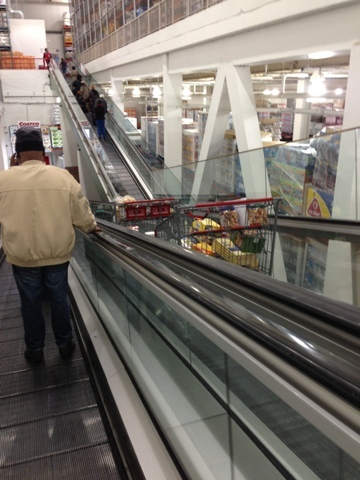 Made it to the Brooklyn Costco, which is two stories. 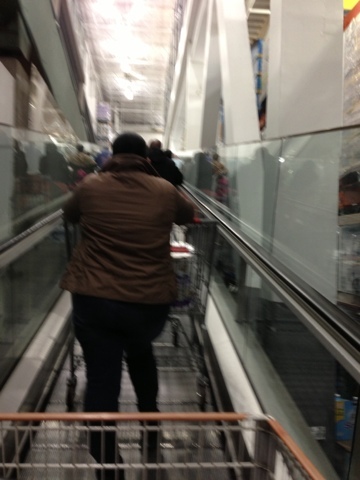 Carts and people ride up and down on escalators. I saw plantains as well as bananas, big bags of dried lentils and lots more kosher items than my Tennessee store. (I hope we get the lentils in Tennessee!) 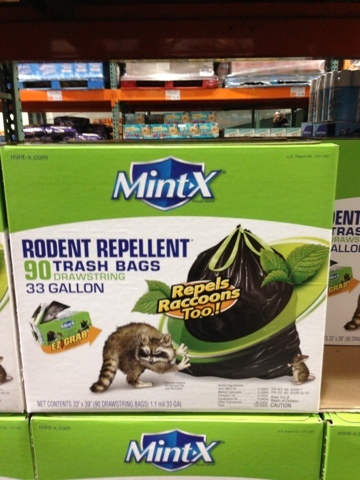 Also, disconcertingly, anti-rat garbage bags. At the check-out, I asked the young man to ring me up a hotdog and drink. "I don't have the codes," he said, rudely. "Oh, I'm sorry. At my Costco they keep the codes at the register." "Where's that?" Said with more than a touch of disdain. "Nashville, and they also do that in South Carolina." "I'll get the codes for you. Just a minute." His whole tone had changed, he was heading for the food court. "No," I said. "No problem!" Even though I was bringing lots of toddler clothes purchased from Costco, the Hanna Andersson dresses, the Carter shorts and the fancy yellow "princess" dress mentioned earlier (see photo), at the last minute I realized I needed to bring a toy to my Brooklyn granddaughter. I found magnetic doll dress-up toys in the Costco book section. These came in Tinkerbelle, Minnie and Princess. Of course, Princess. I'm happy I did this. Clothes are NOT real presents. I'm glad I remembered.